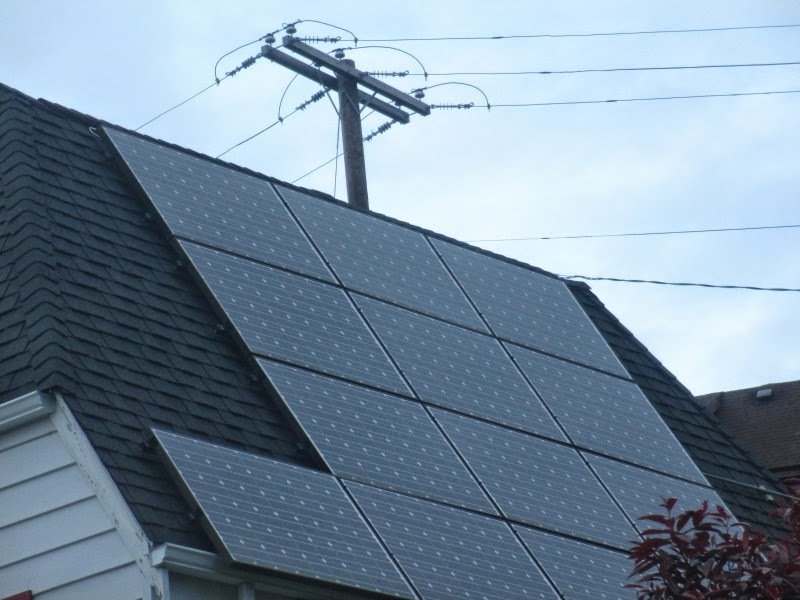 Is it worthwhile for people, with home solar installations, to sell power to the power grid during periods when the solar installations are producing extra power? Maybe the cost of safely collecting this power, from all these small sources, is higher than the value of that power? See more article below picture. Solar collectors on a house I biked past today. Power line in the background. I keep reading about utilities that now wish to charge a fee to customers who have home wind or solar installations. A fee for selling power back to the grid. Wouldn't this mean that the utility just doesn't pay for that power anymore? Currently the utility credits the customer for that power. Right? Maybe they just want to credit the customer less? None of this has been explained very well. One wonders what the true economics is behind these proposals, or if utilities, in some states, are just trying to wipe out alternative energy? Are they all friends to the evil Koch Brothers? Is this just a sinister plot, or is there some real economics behind these proposals? Is it really worthwhile to sell power back to the grid? If the costs are higher than the benefit, why would anyone want to do this? If utilities start charging the owners of rooftop solar panels for the privilege of sending their power back to the grid, wouldn't the owners of the rooftop panels just not send that extra power to the utility? Wouldn't they just use their solar panels for their own power and use power from the power grid at times when the solar doesn't provide enough power, but not try to sell the extra power back to the grid? This brings up the question of storage, which is also a bit expensive, but coming down in price also (like solar panels). Maybe it's better for the owners of small rooftop operations to find a way to store energy, during times of excess power from the solar collectors, rather than selling it back to the grid? Is storage a better strategy than selling power back to the grid? Storage, such as batteries within the home, for times when less solar power is available; such as for use at night. These proposals, such as Oklahoma SB 1456, that keep cropping up in a few states, bring questions to my mind. Finally, an article that explains the science behind this beyond just the politics. Explaining the problem some utilities face integrating distributed solar into their power grids. The need for better storage. Thanks to a reader for pointing this out. Vanadium: The metal that may soon be powering your neighbourhood BBC News Magazine June 13 2014.